Wedding preparations can occur in any of the rooms, buildings, or homes offered by the Wilburton Inn, and this image of a groom was captured in the Inn’s RKO Movie Star Room. Bridal preparations receive the bulk of the attention during the wedding planning process, but where the groom dresses and spends time with his side of the wedding parry is equally as important. We frequently joke that the bride gets ready over the course of four hours while the groom throws on his tux and shoes in seven minutes flat. 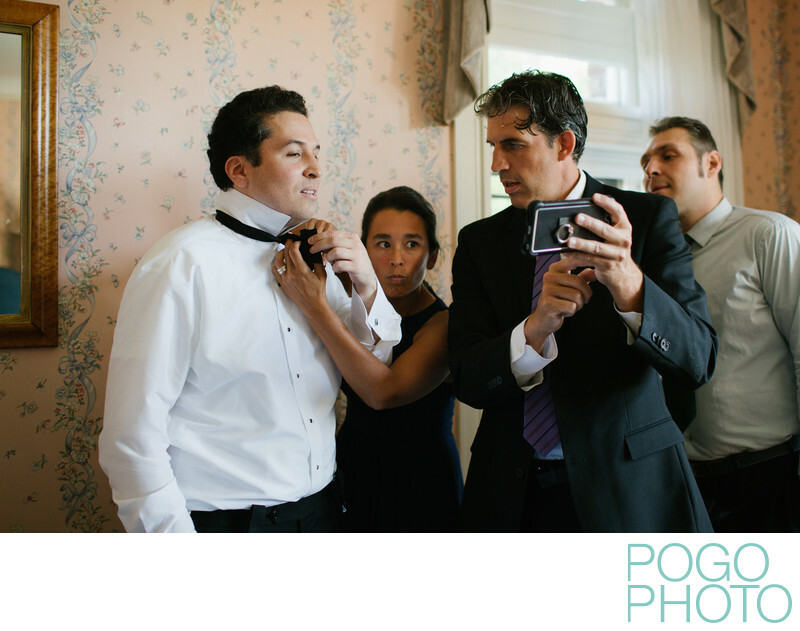 This frequent gap in timing provides the groom ample time to either relax or participate in some pre-wedding fun with his friends, or at least with Steve and his cameras. Having a location that instantly lends itself to photography can add character to not only the photos taken there, but the memories associated with the time spent in the room. Having a space such as the RKO Movie Star room is infinitely more desirable than a windowless board room labeled as the groom’s room at larger hotels, or the generic and poorly lit men’s locker room at some resorts. All the rooms at the Wilburton have names, and much like the inn itself, come with some great stories. The RKO Movie Star room so named because plenty of movie stars stayed here back when RKO Pictures owned the property. In 1977, past their heyday of having Fred Astaire and Ginger Rogers grace the screen after their company’s name appeared, the RKO Pictures - General Tire company used the proceeds from the sale of the nearby Equinox Hotel to acquire the Wilburton, just outside of downtown Manchester. A more secluded retreat, the inn became an escape for anyone associated with the company, businessmen and movie stars alike. Being in the room, which is located on the second floor of the main house that was constructed in 1902, you cannot help but wonder who may have stayed in this exact room or what deals may have been closed nearby. RKO Pictures still exists in a smaller form today, but they are known for plenty of famous movies, including arguably the great film ever made, Orson Wells’ 1941 masterpiece Citizen Kane. Today, our friend Melissa Levis and her family welcome guests with open arms. Her parents purchased the estate in 1987 on a whim while enjoying a dinner and celebrating their golden anniversary. Melissa is one of the happiest people we have ever met, but there is someone residing at the inn who is somehow even more upbeat, despite being only eleven inches tall. Jetson, who simultaneously serves as a greeter and mascot, is Melissa’s King Charles Spaniel. He manages to say hello to us about a dozen times per day every time we stay on site. In addition to the RKO Movie Star Room, the Wilburton has multiple cottages available for rent. The bride for this particular wedding chose the Green Mountain House for her wedding prep, located walking distance from the main entrance to the inn. It overlooks many pieces of modern art scattered across the property and is adjacent to The Museum of the Creative Process, curated by Melissa’s father Albert. Location: Wilburton Inn and Restaurant, Green Mountain and Finger Lakes National Forests, Wilburton Dr, Manchester Center, VT 05255. 1/400; f/2.0; ISO 1000; 35.0 mm.